Here at Ameritex, it’s our business to ensure the safety of your items and furniture while moving. For the safety of your things, we use high-quality packing supplies to protect your items throughout the move. Shrink wrap, bubble wrap, paper wrap, and tape – all essentials you can’t do without when it comes to moving. With an abundance of wrapping supplies, we properly and safely wrap every item to reach your new place in their original condition. With our team of professional movers, you don’t have to deal with the annoying habit of tape sticking everywhere and damaging things – we’ll do it for you. Items need protection when moving so that they don’t rub against each other, or any walls or stairs. 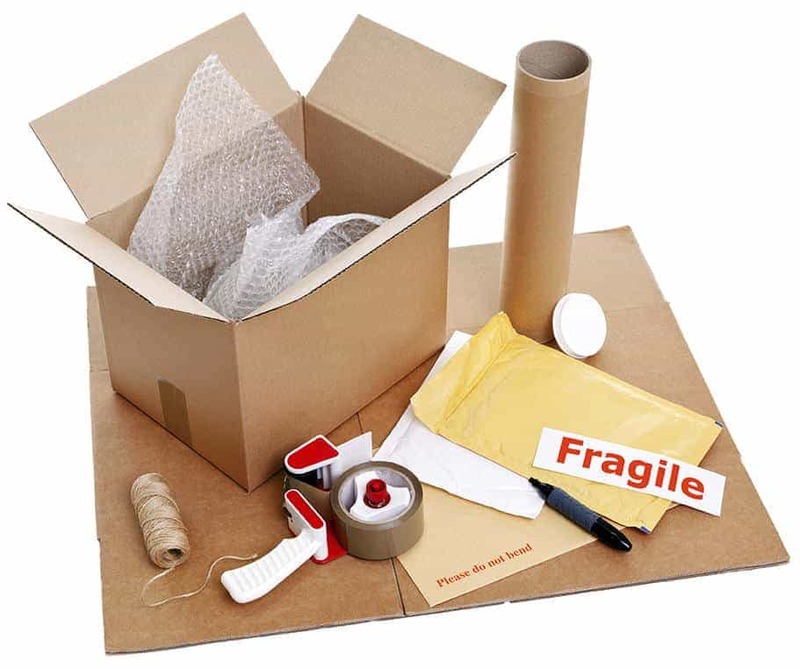 You have many options to pad and protect these fragile items when moving with our padding supplies. With the right padding and wrapping, everything stays safe. Ameritex Movers offers the use of over three dozen double-quilted water-resistant moving blankets with every move. Our moving crews carefully wrap your furniture with these blankets to ensure safe delivery. The microfiber side has tightly woven fabric, which makes it more puncture-resistant. This helps save the corners of your favorite desk or that antique coffee table. Moving into storage or need things wrapped for a long period of time? Not a problem! That’s where paper pads come in. Just like moving blankets, paper pads are the same size and offer an equal amount of protection. Multi-ply durable paper is designed to wrap and protect your furniture pieces from dust and debris while in long-term storage. The cost is minimal, and they offer maximum protection. When everything is efficiently wrapped and packed, it’s time to store it properly. Boxes and cartons allow your items to be collectively moved from your old place to our trucks, and then to their new place. Once everything’s packed and ready to go, you can rest assured that your items and furniture will be safe during the move. Plus, you can literally rest because we’ll do all the hard work for you! Ameritex Movers offers a wide variety of moving boxes to pack and move your belongings. When it comes to moving boxes how do you know which box to use for what? Well, it’s actually quite simple. When packing, the goal is to put the heavier items into smaller boxes and the bulkier, lighter items into larger boxes. For example, books and canned goods can go into small boxes, and comforters, pillows, and blankets go in a large box. Everything in between can go in a standard 3.0 medium box. We suggest that you pack all liquids such as cleaning and laundry supplies in plastic bins. What to do with the oversized, odd-shaped items that don’t fit in a box? Our GoGo Carts are the solution. Each customer receives the use of one complimentary GoGo Cart to use during the move. The carts are triple-ply durable corrugated boxes that are approximately 4 feet by 3 feet. Your moving crew will use these huge open-topped boxes to quickly and efficiently transport those hard-to-pack, time-consuming items. For example, GoGo Carts are great packing supplies for items like vacuum cleaners, curtain rods, large pictures, and more. GoGo carts are yet another solution to minimizing your stress and saving you time and money during your moving and relocation process. Need additional GoGo Carts? Just say the word, and we’ll gladly offer additional GoGo Carts to rent or purchase. Wondering how on earth you’re going to move your clothes? Let us simplify that, too. Ameritex Movers offers the use of three complimentary wardrobes boxes to use throughout your move. Wardrobe boxes are great because your clothes stay on the hangers the entire time! Wardrobe boxes are tall boxes with a uniquely designed hanging rod. Once the box is assembled and the rod put in place, you’re ready to go! Simply transfer your clothes from your closet into the wardrobe boxes, seal, and deliver. It’s that easy! But what about your shoes, purses, belts, and hats? Those are not a problem, either. There’s enough space underneath your clothes to pack the rest. Each wardrobe box fits approximately 3 to 5 feet of clothing, depending on bulkiness. Plus, we have additional wardrobe boxes available to rent or purchase. Moving can be costly, and if you’re on a budget, there are some great alternative options to save on your packing supplies. Check out the newspaper, craigslist or eBay for gently used boxes. You can also check with your local grocery store. Do your family or friends move often? Asking them to recycle and reuse their boxes will help them, you, and the environment. Plus there are many fun ways to recycle your packing supplies! Ready to make a move? Call Ameritex Movers today for a stress-free move and all the packing supplies you need.